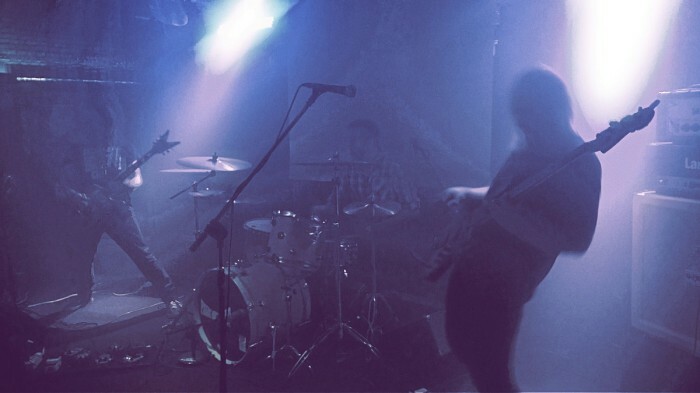 When Wroclaw trio Spaceslug made their debut last year, they immediately distinguished themselves via a sense of space created through big riffs presented with even bigger tones, vocal laze and a heavy psychedelic undertone of jamming that made the whole affair more fluid. That album was Lemanis (review here), and it sold completely through its cassette (on Southcave Records), CD (on BSFD Records) and vinyl (on Oak Island Records) pressings. Not surprisingly, as the Polish group follow-up such a successful first outing, their new album, Time Travel Dilemma, does not attempt to fix what wasn’t broken in their sound. Those who caught onto the depth and vibe of Lemanis will find the six tracks of Time Travel Dilemma work from a similarly potent brew — the key differences are of affirmation and progression. Yes, both records meld drifting melodies and massive tones together to affect a thickened sonic liquefaction, but Time Travel Dilemma, frankly, learns from its predecessor and moves the band — guitarist/vocalist Bartosz Janik, bassist/vocalist Jan Rutka and drummer/vocalist Kamil Ziólkowski — forward in a style that’s quickly becoming their own. In other words: Progression. The affirmation comes in letting their audience know that their first offering was no fluke, but rather the beginning steps on a path that the languid heft of “Parahorizon” on Time Travel Dilemma finds them walking further along. The vocals are more confident. The songs are more distinct, and the flow between them over the total 44 minutes more resonant. 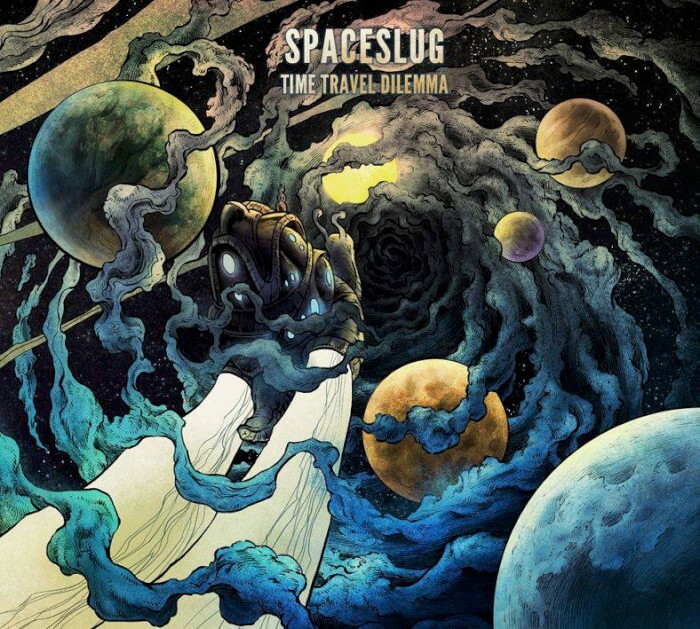 It is simply a more realized interpretation of Spaceslug‘s sound. Although the closer isn’t actually the longest inclusion, the openness of the ground it covers gives a sense of expansion anyhow, and with “Osiris” at the outset, “The Great Pylon Collider” and — perhaps most crucially — the penultimate interlude “What Falls is Fallen” creating a bridge between “Parahorizon” and its sprawl, “Time Travel Dilemma” serves as the end-point to which all the gorgeous, grooving motion seems to be heading all along. That’s not to take anything away from the impression left by earlier cuts. “Osiris” is pivotal in setting the stage for what follows and a standout on its own — Rutka‘s bass work there and across the entirety of Time Travel Dilemma should be a blueprint for other groups to learn from — and the apparent ease with which Spaceslug move from subtler hypnosis to more driving crescendos on “Living the Eternal Now” — which in its second half also samples Alan Watts, whose voice appeared as well on YOB‘s Clearing the Path to Ascend — not only makes that track a highlight, but along with the vocal melodies it underscores the growth the band has willfully undertaken in such a short time. And while that growth, which can also be heard in the push of “The Great Pylon Collider” and in crossing the 23-minute span of “Parahorizon,” the ambient “What Falls is Fallen” and “Time Travel Dilemma” itself, is a key element, anyone among the converted who might be catching onto Spaceslug for the first time shouldn’t have any trouble getting on board with where they’re coming from, the warm and natural vibe of their sound (recorded and mixed at Satanic Audio) or the lack of pretense in their presentation. The latter especially is enough to make one wonder just what exactly the “dilemma” is that Spaceslug are having in their fourth-dimensional excursion — everything seems to be rolling along so smoothly — but if there’s a narrative at work in the tracks, it would seem to be resolved by the time the finale disintegrates, leaving behind only a sense of balance in the cosmos; satisfying in the reality it’s already created and seeming to align toward future expansion. While Time Travel Dilemma comes as a quick turnaround from Lemanis, released almost exactly one year later, the development it shows reinforces the potential Spaceslug seemed to have on their debut while also moving forward within it. As they hopefully continue to grow their sound, one wouldn’t be surprised to find them following varied inclinations — here more patience in their jamming, there more structured songcraft — but part of what makes Time Travel Dilemma so effective is its apparent unwillingness to be settled in a single direction or the other. One hopes that adventurous impulse persists as well, since it will only further the richness of approach Spaceslug unfurl here. There are aspects of Time Travel Dilemma that most certainly play to genre, but even these do so with a palpable intention toward leaving an individualized mark rather than simply repeating what’s come before. To call that admirable would be an understatement. This entry was posted	on Friday, February 10th, 2017 at 6:07 am	and is filed under audiObelisk, Reviews. You can follow any responses to this entry through the RSS 2.0 feed. You can leave a response, or trackback from your own site.